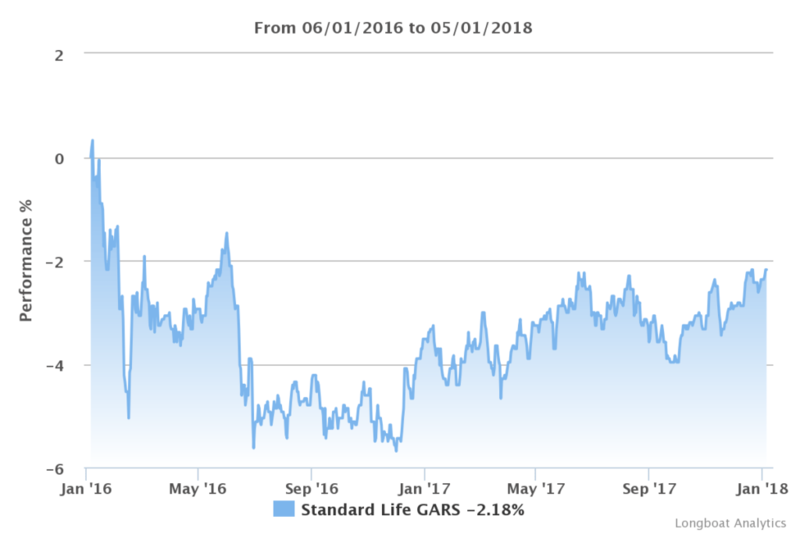 Is your money in Standard Life’s GARS fund? If the answer is yes, it’s time to review your investment strategy – and the advice you’re getting. The Global Absolute Return Strategies fund has been a favourite for Irish financial advisers and brokers in recent years. We’re wondering why. Got money stuck in GARS and wondering if you could do better? Moneycube can offer you alternatives. Tell us your requirements and we’ll get to work. Fact is, its recent performance has been woeful. Through the last two years of the stock market bull run, global stocks have risen something like 40%. You might think, then, that GARS investors would be seeing the benefits of this. As the chart above shows, €50,000 invested in GARS in January 2016 is worth something like €48,880 now – and that’s before any advisor charges you’ll have paid on top. (Please note this post was originally published in January 2018. We’ve kept the original figures, and you’ll find updated figures for Feb 2019 below). Although some of 2016’s losses were recovered in the last 12 months, the fund is still down 2.2% compared with two years ago. Not much in the way of Absolute Return there. Had you taken the plunge and simply grabbed a bunch of stocks, you’d be sitting on something in the region of €70,000. Ouch. Here’s a chart starting from the same date (1 Jan 2016) as our original article. 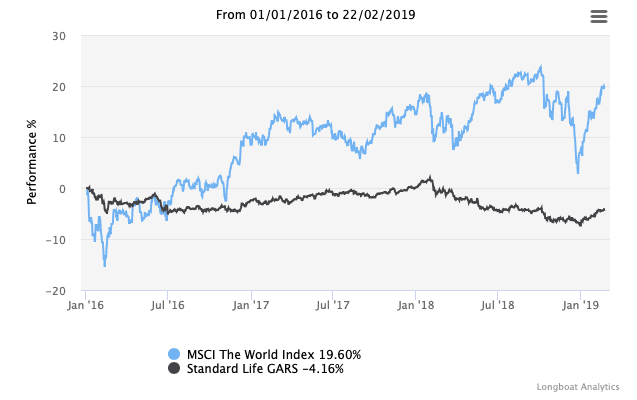 It updates performance to 22 Feb 2019, and compares GARS to the world index from MSCI. GARS is now down 4.2% compared to January 2016! The world index is up 19.6%. It wasn’t supposed to be like this. One reason GARS was favoured by so many investors is because they hoped it could make a return above bank interest rates, whatever the market conditions. To be fair, Standard Life itself only promises returns over an average 3-year period. The performance could certainly turn around. But having missed out so badly in the last two years, investors need something close to a miracle to deliver on that aim of 5% plus. There are several options. Selling out – in full or in part – is certainly one of them. But tread carefully – and talk to Moneycube first. For instance, if you have invested via a life insurance policy, you don’t want to trigger an exit tax charge by selling up. Instead, we could help you move the money into some of Standard Life’s other funds – many of which are top performers, as the table in last week’s blog shows. You could probably cut your advisor fees at the same time. Depending on your circumstances, other fund providers may be more suitable for you – they could offer simpler funds, cheaper charges, and more transparency. (Here’s one idea, for example). So if you’re thinking of moving your money from Standard Life GARS or another investment, talk to Moneycube first.